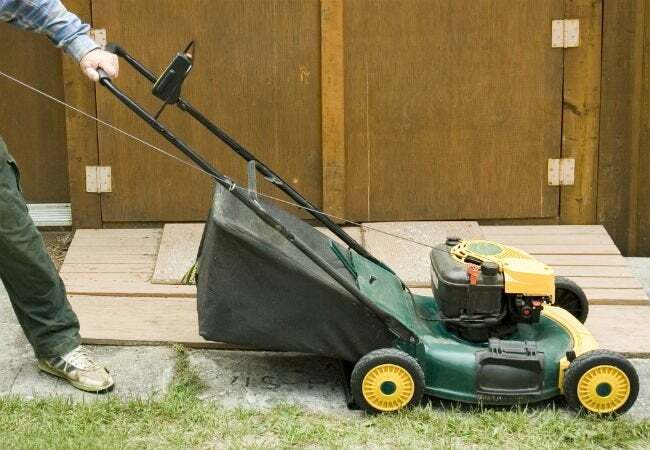 If your lawn mower just can't get going, try one of these quick fixes to put it back to work. Lawn care can be a tedious chore, but once the grass starts growing in the spring, mowing becomes an inevitable fact of life. When you finally muster the strength to tackle that first cut of the season, there are few sounds as disheartening as that of an engine that revs, but doesn’t start. Before you drag the mower in for repairs, or invest in costly replacement parts, first make sure that a clogged air filter, soiled spark plug, or contaminated gas isn’t to blame. Check out these possible perps by working through the following steps, and you may be able to get your puttering grass guzzler up and running again in no time. 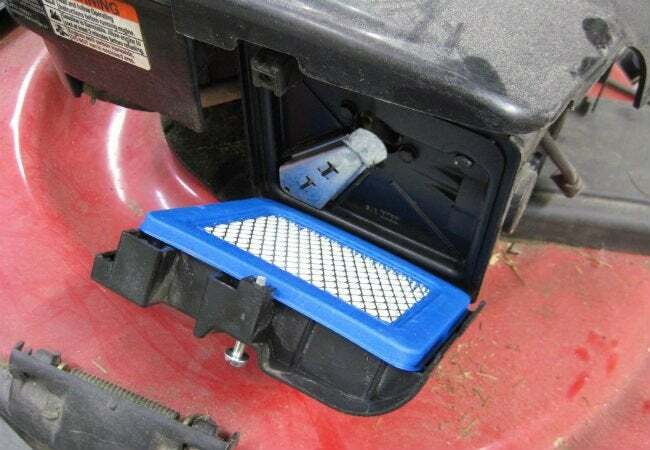 Your lawn mower’s air filter guards the carburetor and engine from debris like grass clippings and dirt. When the air filter becomes clogged or too dirty, it can prevent the engine from starting. To keep this from happening, replace paper filters—or clean or replace foam filters—after every 25 hours of engine use. The process for removing the filter depends on whether you are operating a riding or push lawn mower. For a riding mower, turn off the engine and raise the parking brake; for a push mower, pull the spark plug wire from the plug. Then, lift the filter from its housing. For a paper filter, your only choice is replacement. If you’re cleaning a foam filter, wash it in a solution of hot water and detergent to loosen grime. Allow it to dry completely, and then wipe fresh motor oil over the filter, replace it in its housing, and power up the mower—this time to the pleasant whirring of an engine in tip-top condition. Is your lawn mower still being stubborn? The culprit may be the spark plug, which, as the name indicates, is responsible for creating the spark that ignites the fuel in the engine. If it’s loosened, disconnected, or coated in water or carbon residue, the spark plug may be the cause of your machine’s malfunction. 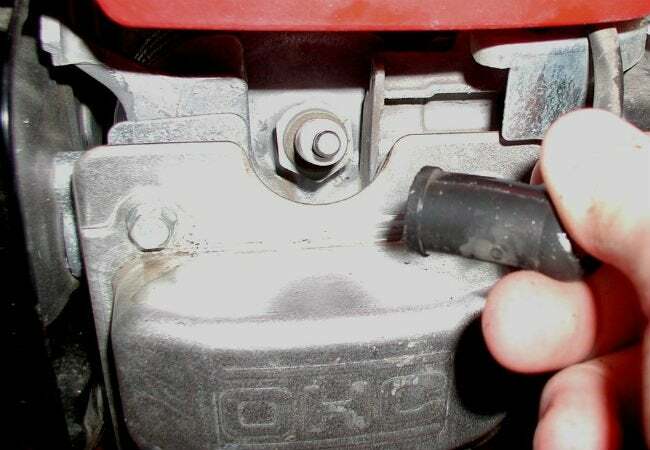 Locate the spark plug, often found on the front of the mower. If it is connected, remove the plug wire beneath the plug cap and unscrew the plug with a socket wrench to reveal the electrode and insulator. If you see buildup, spray brake cleaner onto the plug, and let it soak for several minutes before wiping it with a clean cloth. Reinstall the plug, first by hand, and then with a socket wrench for a final tightening. If the problem persists, consider replacing the spark plug. 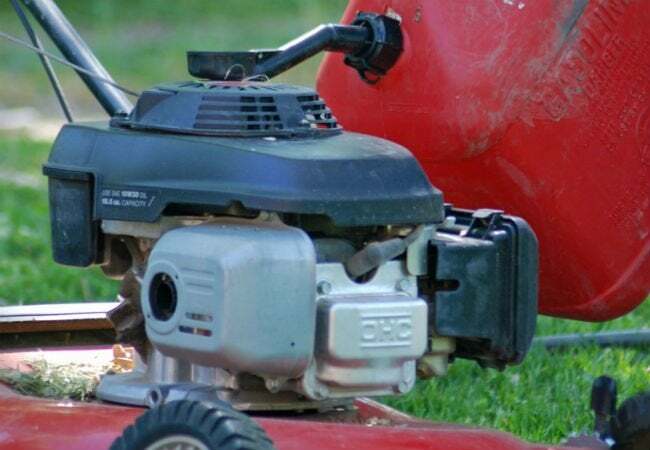 An obvious—and often overlooked—reason your mower may not be starting is if the gas tank is empty, or contains gas that is either old or contaminated with excess moisture and dirt. If your gas is more than a month old, use an oil siphon pump to drain it from the tank. Then, refill with fresh fuel and a fuel stabilizer to extend the life of the gas and prevent future buildup. If that doesn’t do the trick, see if your lawn mower has a fuel filter (not all do) and whether or not it’s functioning properly. When clogged, the engine can’t access the gas that makes the system go. To check the status of your fuel filter, remove the fuel line at the carburetor. If gas doesn’t flow out, confirm that the fuel shutoff valve isn’t accidentally closed, and then remove the fuel line that’s ahead of the fuel filter. Gas should run out freely, assuming that the problem is with the fuel filter; consult your owner’s manual for specific instructions on replacing the filter and reassembling your mower. With no more excuses, go back out there and get your grass in shape for summer! How’s your lawn care IQ? If you’re like many homeowners, you’re probably making one or two serious mowing mistakes. Take a look at our video to learn how you can improve your lawn care routine.